Learning New trick AND Meet my boyfriend "Patton"
Hey Everyone!! I have so much to update you all on but for tonight im going to leave it to TWO pictures and a VIDEO! So this is Patton my Viszla boyfriend... Yes yes I know I am bigger than him!! but still I love him and he is my best friend. He is only 1.5 months older than me so we get along so well. I dont think he understand why im getting so much bigger than him so fast though! Anyways. We love to go to the bark park together and also go on long walks in new and fun places!! Secondly... I randomly did a cool trick for mommy today and supposidly its something that she actually wants me to do so shekept teaching me and now I know how to "kind of" pivot from "front" to "heel" positions. And mommy and I swear that I was doing this trick perfectly until she turned on the camera.. but near the end I get really good again. Mommy was so happy with me that she started tearing up!! I seem to learn tricks and obedience quickly so she is super proud! Anyways here is the video! I'm a Dane and I CAN Fetch! 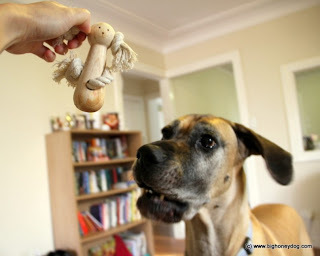 MY DANE CAN FETCH!!! I dont care whateveryone else says!! So when I got my Dane EVERYONE on earth told me I would never get my dane to fetch.. but guess what all you nay-sayers (not sure if that is how its spelled our or whatever).... Nova CAN fetch and she is getting pretty good at it!! So we are so glad Nova is having fun with all her fetching!! I hope that she keeps with it and wants to Fetch forever!! We will see! Nova excepting her gift and showing her old retired stuffy! Well I bring that up because it seems someone sent us what looks to be like a Halloween gift. We got a small and a large log doggy mummy!! They are super squeeky and super amazing!! These are absolutly our favorite toys! So Me and little sissy got wonderful stuffie halloween gifts and we are very happy and thankful!! I Absolutly Need Some Help!! Hey Everyone!! I 100% need your help! 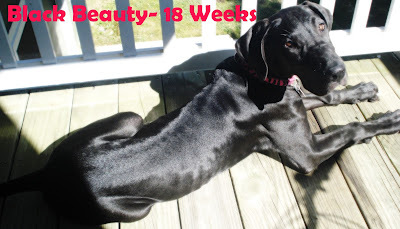 IF you dont know about great danes one thing to learn is they EAT A LOT! So the Navy Exchange is doing a contest for cute pups, cats, and other small animals! And it would help out SOOOOO much if you could click on the link and click "like" for the Navy exhance page and then "Like" Nova's photo! Anyways I would 100% appreciate your help and any of your friends help because we ACTUALLY do need the money for Nova's feeding habits! Remember: FIRST "Like" the Navy Page (you can unlike when youa re done voting" THEN "like" Nova's picture. BOTH links are above!! we appreciate it sooo sooo much! Also if you have a lot of followers, please let your followers know that Nova needs some help to buy some bags of food!! the more votes she gets the etter chance at getting more high quality INNOVA food! Okay so today was an extremely bad day!! Mommy took me on a walk and I did horrible!!!! Then I was bad in the house all day unless I was napping. Then I went on another walk with my doggie friend Patton and I made mommy even more mad. I dont feel like listening to mommy at all today and I want to ignore every word she says... so that is exactly what I did.. Mommy said that if I have another day like this I am going up on Craigslist.org.... (she was joking though)... Anyways.. today was a bad day and mommy cant wait until its over!!! Hello all! I am so sorry I havent been around much lately. My mommy started training for her new job and she has been too busy studying some nights. So today I am 18 Weeks old today so I am slowly making my milestones! So since I have missed so much I am just going o post a video of me that mommy made last night! I hope you all enjoy! Hey Everyone.. Its me NOVA.. I just really wanted to show off a picture of my sissy, Teagan, today!! Isnt she a super cute pup? Where ever we go she still gets all the attention because everyone cannot stand but love little tiny tiny dogs. 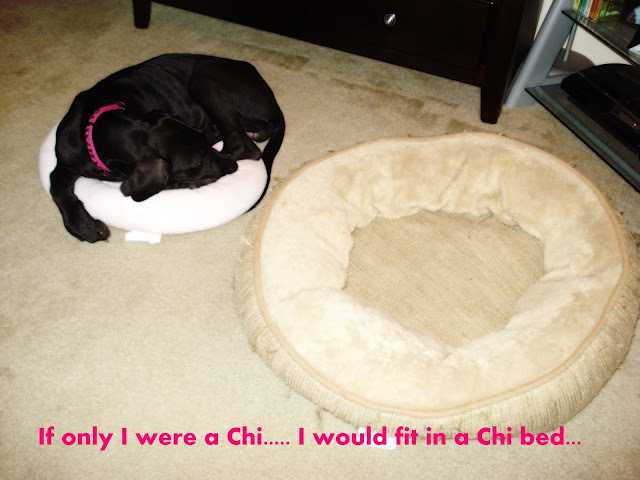 Mommy tells me she still has never seen a Chi smaller than my sissy and I havent either! People are suprised to know that she is almost two years old and so small!! But anyways.. more about me! Life has been calming down since all of my friend's humans are back to work and in school and things.. So mommy and I get to go on lots of long walks alone and we have to do a lot of stopping and going.. she says its something im doing and so she makes me stop.. have any of you other pups heard of the word "pulling"? I am trying to figure out what that is.. but everytime I do it mommy makes me stop and then when I gain focus we get to start walking again. Mommy has been doing so much better with me because she has realized that I cant know everything and get everything the first try (especially walking with all these cool things aroudn!!) I am sure she always know this but she just needed to get a handle on it! So, yesterday I saw these little tiny humans and I absolutly hated it! do you know what im talking about pups?? CHILDREN... Mommy knows that I need to meet a lot of people and see knew things but mommy doesnt know a lot of these children people.. I dont know what makes them so different but I dont like them much. Im super shy around them and I freeze up and just chill out beside mommy (even in the bark park with all my puppy friends). Mommy needs a little help you guys, so if you have any advice for her on how she can get me to like these little tiny people.. please let her know all about it! She knows that she cant force me to like them and that she shouldnt reasure me when im so scared but she needs help! She has tried letting the children feed me treats and by the second time they fed me treats I wouldnt even take them I was so scared!! So lastly, (since this is so long) The Bark in the Park event was put off due to rain and it will be on Oct 24th! So thank goodness mommy is still going to take me.. but she wont be able to take Teagan ( sad face) because she cannot handle us both without daddy here. (Daddy is on a huge ship sailing around the ocean doing his job with the Navy) So... mommy is super upset about it.. but she does feel like I need the socialization and it will get me some major exercise. So that is all for today. I am still hasseling mommy to put up more videos of me on here! So Sorry she hasnt done that yet! 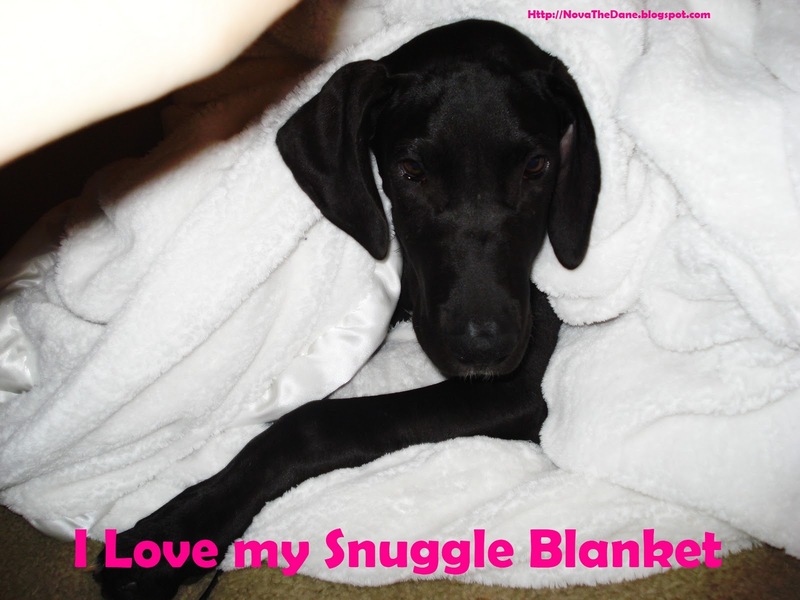 Snugglies, New Treats, and Honey the Dane.. OH MY! Hello All!! So tomorrow is the BIG FUN Bark in the Park day tomorrow! I really have no idea what we are doing there yet but mommy says we are going to be able to meet a WHOLE BUNCH of Great Danes and Many Many other breeds! She seems more excited than me but tomorrow im sure my tail will be wagging too!! Okay so secondly my mommy brought me home these wonderful yummies today and wanted to know if anyone else has tried them. She bought three different kinds: Rasberry Pumpkin, Apply Peanut Butter, and Papya Cranberry. We would first really like to know if someone else has used these and what they thought of them. For what I think... I LOVE THEM!!! They are soo soo yummy.. I always want one and when im not eating one I am thinking about when mommy gives me another one.. And and and.. guess what!!!?!? I COME WHEN MOMMY CALLS ME with these treats! and not just anywhere.. but even in the Dog Park that is at our house even when doggies are in there playing with me! Can you believe it?!?! I think this treat is really helping mommy because she was getting super upset that she couldnt get me to come when she called me.. She usually has to wait until another puppy run back to the top of te dog park and then I just follow along and mommy gets me! So we love these! Writing by my Mommy, Kailin not Nova! I DO NOT own this photo. Photo was taken by Honey's Human! 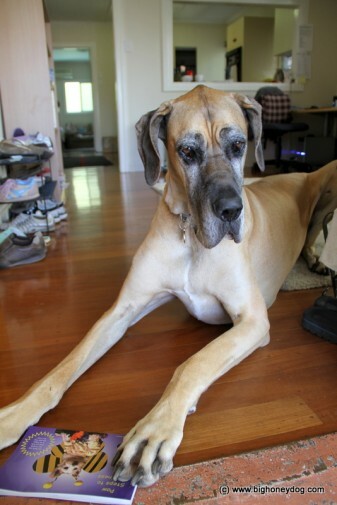 So I am pretty sure I dont have to introduce who this is but if you are not as into Great Danes as I am then maybe you dont know Honey the Dane and her Human Hsin-Yi. 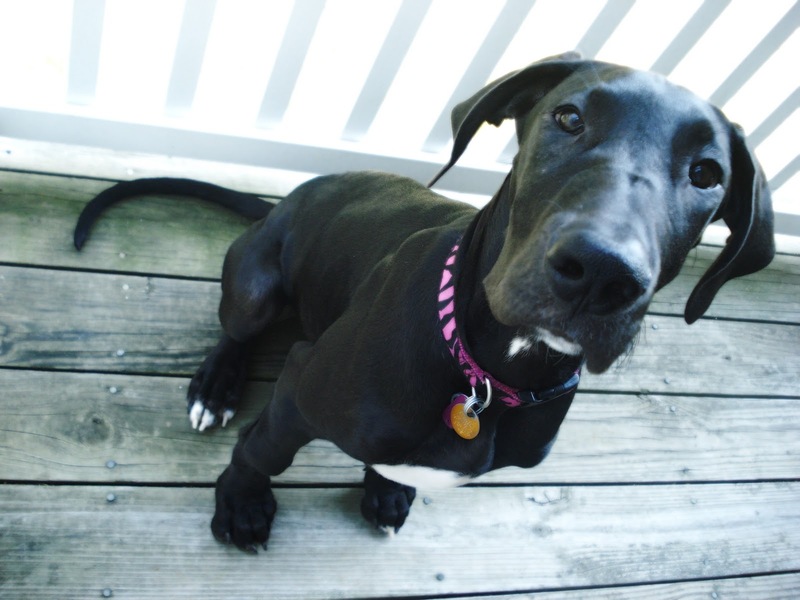 I first found Honey on youtube when I was looking into getting a Dane and lets just say... Honey and her Human had me sold on getting a great Dane. I watched all her videos before I adopted my baby dane Nova. I really got interested in clicker training and just learning how to give the best life to My Dane, My Chi, Hubby, and Me by having a well behaved Giant Dog. So anyways that is my intro about my absolute favorite Dane and absolute Favorite Blogger/youtuber. I enjoy all that Honey and her Human do together and appreciate everything that they do for the doggie community asking all the crazy questions that we have and they take the time to answer.. But the whole reason I brought this up is because I have to admit something! I am not into famous actors and actresses and celebrities.. BUT... Honey and her Human are my equivelent of celebrities! (and I think they are in this community). I get all giddy when they post a new blog and when they come over to my channel and help me out and just check out what is going on with Nova. So Honey and Hsin-Yi, Thank you so much for all you do! I am the Triple-3 today!! I was reading a cute blog..Sally's Blog... on a sleeping contest so I am going to enter too!! It looks super fun and I have some great sleeping photos!! 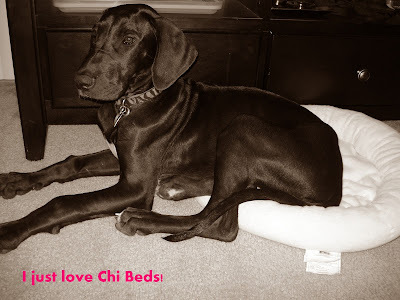 This is my picture entry for Sally's Sleeping Beauty Contest... Arent I a beautiful Dane!? So this is my photo that im entering.. dont I look super silly??? If you would like to enter it ends super soon so go check it out HERE. below for my entry into Sally's Sleeping Beauty contest! Hey pup lovers! I justed wanted to start out by saying im the BIG 3-3-3.. If you dont know what that is well its a bunch of threes.. and supposidly my age today is 3-3-3 and Mommy says that is her favorite number so today is supposed to be a good day! I have a couple subjects today.. so here we go! 1st... Mommy is teaching me some more loose leach walking and she found a great little training session on youtube that she loved so much because it is working with me! (I am pretty good about LLW already but I have my moment and when there are distractions then I gett a little "Zoomy". So here is the video she saw on Loose Leash Walking. 2nd.. Im learning a lot of new tricks and refining on all of the ones I already know.. I dont see why, I think im pretty perfect but mommy says we need to work on some things. I am mostly working on Targeting and hopefully Mommy will have a video up about targeting soon! 3rd... I will be going to my first Dog Party this weekend! Its on Sunday and Mommy says its called "Bark In The Park". There are going to be some super fun stuff going on and you can see what we are doing on the link! 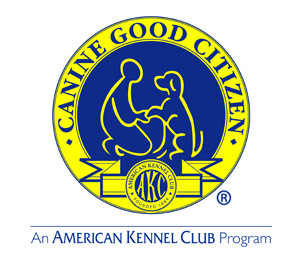 We are also doing a dog walk for the Chesapeake Humane Society so if you would like to help sponsor us you can sponsor me HERE. Anything helps and the animals would super appreciate it! Alright so I think that is it!